I grew up in a cluttered house. For one there wasn’t enough space for all five of us in it and well everyone in my house had a love for tchotchke and collectibles. I married a man who is against all things tchotchke (but is surprisingly a pack rat) and I have been fighting my clutter gene ever since. We started our parenthood journey in a good size but still small 2 bedroom apartment. Necessity helped us keep "stuff" in check. As we enter our fourth year in our house I look around it I can’t believe how fast we have accumulated so! much! stuff! It’s really too much, .I feel guilty for the over excess, I feel suffocated by all the things. One of my goals for 2012 was to declutter. I want to make a point to only surround ourselves with things we love and use. I want to live smaller. 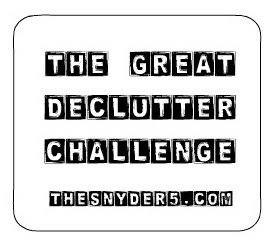 Sometime last year I found Molly’s blog, The Snyder 5 she had been working on a 500lb challenge to clear 500 lbs of clutter fro her life. If I had 2-3 more people in my house it would feel smaller. Yet I’m sure I have that much flotsam just floating around the house. Things that we keep "just in case", because we don’t know what to do with it, because someday we may need it. As a crafter and DIYer I know I am huge culprit in this. If something seems useful I am reluctant to get rid of it. Not anymore. The clutter stops here. 500lbs of stuff. Unwanted, unloved things that are taking up mental and physical space. Today I cleaned out 2 drawers and half my closet as I put away laundry. I wasn’t deep cleaning, just re-sizing the babies drawers and getting my closet ready for this month’s Dress Like a Girl Challenge. In one afternoon without trying I got rid of 6lbs of stuff. This is going to be good, I can feel it. 6lbs down, 484 to go. Are you a neat freak or do you have the clutter gene? How do you control all the stuff that comes into your house. I would love to join in! I am feeling the urge to purge!!! Oh I so need to do this! Our last move filled a 53ft truck and they had to bring another for the overflow - yes, 53ft ... we own toooo much stuff! You already know this, but I am in!